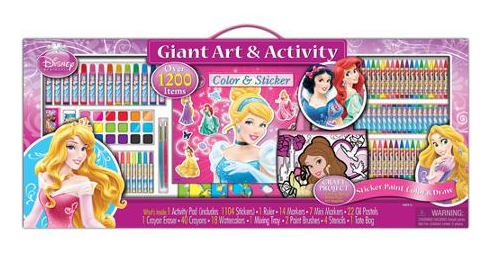 Artistic Studios Disney Princess Art and Activity Collection Set on CLEARANCE for ONLY $8.00 + FREE Pickup (Reg. $15)! You are here: Home / Great Deals / Artistic Studios Disney Princess Art and Activity Collection Set on CLEARANCE for ONLY $8.00 + FREE Pickup (Reg. $15)! WOW! Right now, you can snag this over 1200 pieces Artistic Studios Disney Princess Art and Activity Collection Set on CLEARANCE for ONLY $8.00 + FREE Pickup (Reg. $15)! This is a great item to stash in the gift closet for an upcoming birthday!